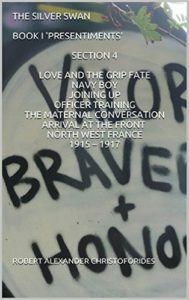 Book I describes the national and social context of the late 19th Century into which Wilfred Owen was born; his family background; his life from childhood; his experiences in France as a language teacher; his decision to volunteer to join up; his joining up; his officer-training; his arrival, in the extraordinarily bitter winter of early 1917, in Flanders/North-East France, as an Officer to fight on the Front Line. Overall, this biographical novel covers the life of Wilfred Owen – 1893 to January 1917. The First World War was the first part of the 20th Century’s World War – the worst in recorded history. This book is a biographical novel. It has no intended ‘agenda’. Nor does it have any ‘political intent’ – in any of the given meanings of that phrase. 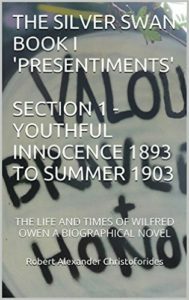 Birth at a lovely mansion, Plas Wilmot, Oswestry, Susan Owen’s beautiful family home – childhood – life following death of grandfather – discovery that he had lost all his money, resulting in sale of Plas Wilmot and all its contents – childhood life following this life-changing event. 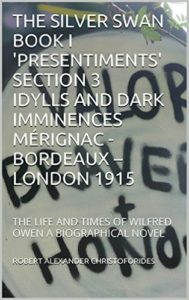 Stay at Broxton/Brown Knowl Cheshire alone with his mother – the happiest time of his childhood life – beginnings of education in finer things. Dunsden October 1911 – February 1913 – the unhappiest time of his civilian life – psychological and emotional crisis – Reverend Wigan and relationship – surrounded by poverty whilst living in luxury at Wigan’s Vicarage – Henley Regatta – health breakdown – leaves Dunsden – abandons evangelical religion. Train journey outing to Swanage for boys. Assignations with Vivian Rampton and others. An important and very ‘formative’ chapter.